The craziest thing people ever say to Francis and me is "meh, I'm not really into the Disney thing." If your idea of "the Disney thing" is amusement parks, costumed characters, and mediocre food, boy are you missing out. OUR Disney thing is luxury resorts, fancy dinners, beautiful scenery, and every type of recreation you can think of. You could easily spend a week at "Walt Disney World" without ever going to a park. 1. Show me another hotel in North America with a savanna outside your window! We had a savanna view room at Animal Kingdom Lodge on our honeymoon, and the giraffes showed up outside out room at 4pm every day. Check out the Wanyama Safari sunset tour of the grounds, followed by a chefs table dinner with South African wine pairings at Jiko: The Cooking Place. 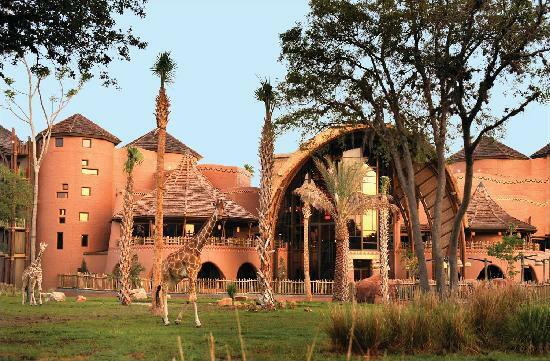 Also check out Sanaa restaurant at Kidani Village for an excellent savanna view while you dine.